This paper presents a novel background knowledge approach which selects and combines existing mappings from a given biomedical ontology repository to improve ontology alignment. 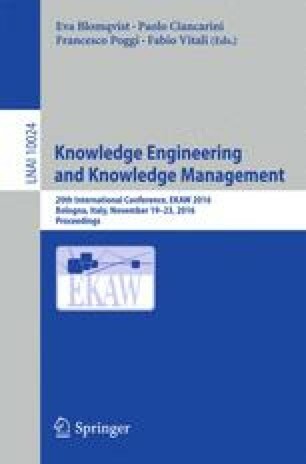 Current background knowledge approaches usually select either manually or automatically a limited number of different ontologies and use them as a whole for background knowledge. Whereas in our approach, we propose to pick up only relevant concepts and relevant existing mappings linking these concepts all together in a specific and customized background knowledge graph. Paths within this graph will help to discover new mappings. We have implemented and evaluated our approach using the content of the NCBO BioPortal repository and the Anatomy benchmark from the Ontology Alignment Evaluation Initiative. We used the mapping gain measure to assess how much our final background knowledge graph improves results of state-of-the-art alignment systems. Furthermore, the evaluation shows that our approach produces a high quality alignment and discovers mappings that have not been found by state-of-the-art systems. This work was achieved during a LIRMM-ESI collaboration within the SIFR project funded in part by the French National Research Agency (grant ANR-12-JS02-01001), as well as by University of Montpellier, the CNRS and the EU H2020 MSCA program.